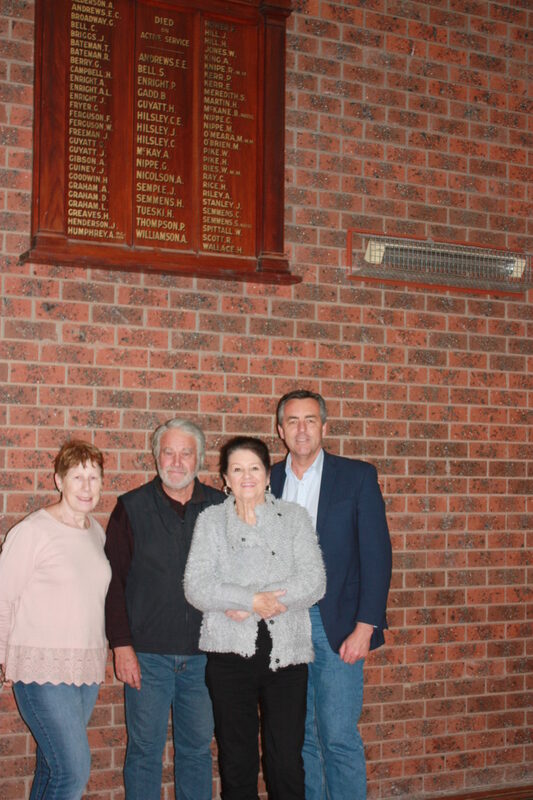 The Nationals Member for Gippsland Darren Chester is pictured with members of the Toongabbie Recreation Reserves Committee (from left to right) Margaret Folds, President Graham Berrett and Joy McLoughlin underneath one of the historic honour rolls to be restored then returned to its original home at the Toongabbie Mechanics Institute. Historic honour rolls listing the names of service personnel from Toongabbie will be restored and returned to their original home, thanks to the efforts of local volunteers and funding from the Federal Government. The Nationals Member for Gippsland Darren Chester has announced $4595 to relocate and restore the rolls. currently hang in the stadium,” Mr Chester said. “The rolls were moved more than 30 years ago when the hall fell into disrepair. Toongabbie Reserves Committee President Graham Berrett said the Mechanics Institute, which dates back to the late 1800s, had now been restored, paving the way for the rolls to return. “We think it’s time for the honour rolls to be re-hung in their original home at the Mechanics Institute,” Mr Berrett said. “We want war memorabilia from our local area to be located in the one place. “We are organising a community celebration to held on Sunday, October 21, at the Toongabbie Mechanics Institute to mark the Centenary of Armistice and the return of the rolls. Funding for the restoration of the rolls and the community celebration has been provided by the Federal Government through the Armistice Centenary Grants Program. Mr Chester, who is the Minister Assisting the Prime Minister for the Centenary of ANZAC, said the Toongabbie committee was one of the first local organisations to receive funding. “This grants program is designed to support local projects and activities that appropriately mark 100 years since the end of the Great War,” Mr Chester said. Under the program, every electorate in Australia is eligible to receive up to $50,000 to commemorate Australia’s wartime history and the 100th anniversary of the Armistice.